SUPERMANIA brings you not one, but two firsts this week – an all-new series of posts on SuperFans and their collections and the first memorabilia showcase from the Salkind produced Superboy TV series from 1988 ever to be hosted on the site. Zach thank you for taking the time to talk to SUPERMANIA about your superb collection. How long have you been collecting super-memorabilia and what drew you to it? 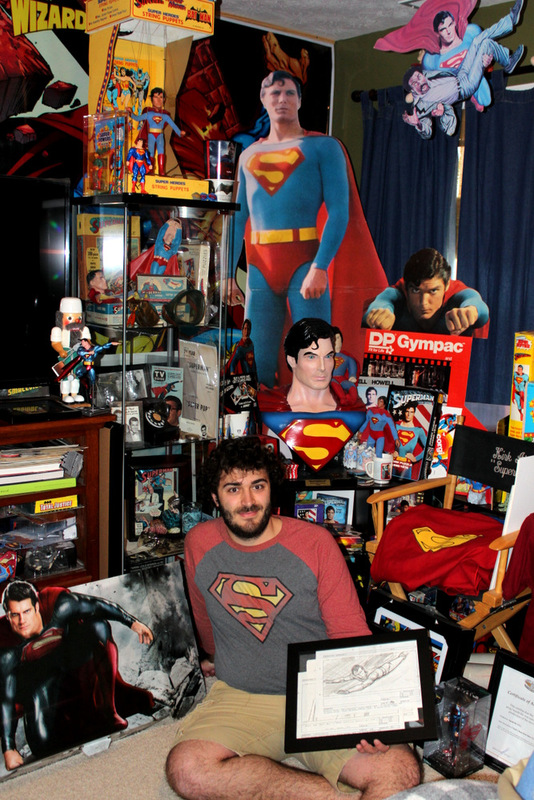 -I have been collecting Superman memorabilia since I was 13 years old and I just turned 23 this week! It’s hard to believe ten years have gone by so fast and that Superman has been a part of my life for almost half of it. I’ve always had collecting in my blood- I collected baseball cards and coins as a kid. It wasn’t until junior high school that those collecting passions shifted towards Superman after falling in love with the character through the TV show “Smallville”. I was obsessed with that show. I watched it religiously over and over again and then picked up a few comics and watched the Reeve movies. In no time at all, Superman was my guy. What is it about the character (and which incarnation) appeals to you most and why? Do you tend to collect from a specific era? Superman stands for truth and justice. In a world of increasing moral relativity and growing evil, Superman represents what is good about human kind. In the words of Brando’s Jor-El, “They are a great people Kal-El, they wish to be. They only lack the light to show the way”. Superman represents the good inside each one of us, the potential of what we can be. It’s inspiring to me. 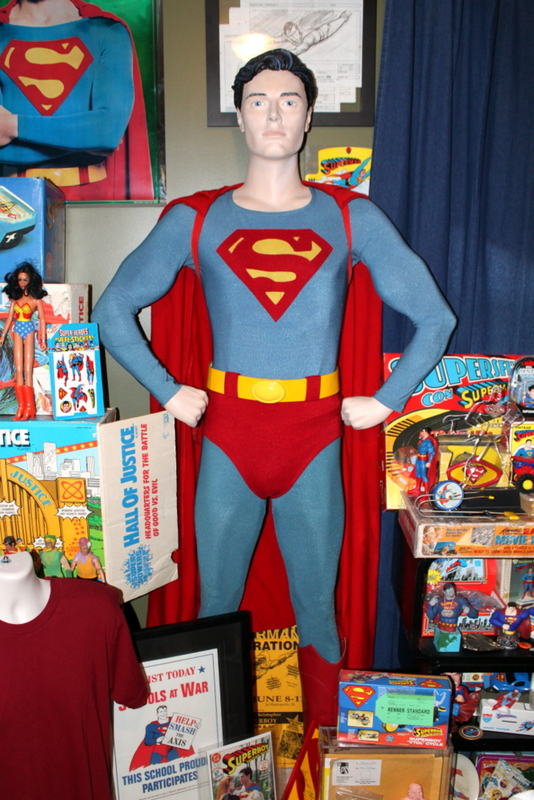 I think perhaps the best representation of this is Christopher Reeve’s portrayal of the character which is why I especially love collecting 70’s memorabilia. Though I really collect from all eras to be honest, because it’s not about the actor for me, it’s what the character stands for. What was the very first Super-item you remember having at an early age and what has been the most difficult piece to add to the collection as an adult? My collection began with two items. Around the time I started really loving the character, one of my church youth pastors gave me a Superman toothbrush he had won at a white elephant gift exchange. That same weekend I went to an arcade and won a plush Superman figure and I looked at these two items together and thought “I think this is the start of a collection”. As far as items that have continued to remain elusive to me, I have had trouble finding original props and costumes from “Smallville” for sale which got me initially hooked on the character. Many of the 1940s merchandising has also been especially hard to obtain. You also work in the vintage toy field which must provide great opportunities to see and obtain all sorts of collectables. What rarities have you seen and what do you recommend as good investment opportunity to fellow collectors? Yeah it’s a fun job. I’m currently a full time student at Cedarville University and will head off to the Ohio State University for dental school next fall. A few years ago I started my business “That Vintage Toy Guy” (Find me on facebook!) to help pay for my hobby and education! It certainly has got my foot in the door with every major toy dealer in the area, which is nice to have first dibs on some cool pieces. I have seen many rare items from nearly every toy line in my time in the business, especially browsing toy shows and conventions. As far as investing, I have two pieces of advice. 1) Always buy vintage. It will always be harder to find. 2) When you don’t buy vintage, buy Lego. Lego’s (especially superhero Lego’s like Superman and Batman) tend to double in value in just a couple of years. Has experience given you a reliable eye for valuations? What is the most scarce article you’ve ever handled and/or the most expensive? What sources or websites do you use and trust? Absolutely! I typically buy out over 100 toy collections per year which requires me to be up to date on values and scarcity of the vintage toy and collectibles market. I base my evaluations on completed eBay listings, certain price guides and books, but mostly my own experience and a wide variety of friends who have expertise in different areas. It’s nice to be able to make a phone call to the right person and get an immediate appraisal for the rare stuff. The rarest item I have handled in regards to my business has to be a double telescoping mushroom tip Kenner Star Wars Darth Vader prototype. It’s one of three in the world and extremely valuable. I live near Cincinnati which is where the old Kenner Toys factory was located so I get rare Kenner items from time to time, including Superman prototypes. As far as the rarest Superman item in my collection (props and costumes excluded), there are several options to choose from. I recently acquired a 1940’s clerk badge for the “Superman Bread” program and it is one of only five in the world. I have a lot of 1940’s items as their scarcity makes the hunt more fun! As this is a site dedicated to the classic Salkind Superman Movie series please give us both your thoughts on the movies and share with us your favourite items. Do you have any props from the films? I just LOVE the Reeve films. They are fantastic and capture the essence of the character in a beautiful way. Superman IV is obviously a little hard to get through at parts, but I will still love it just because of Reeve. I also am not a huge fan of Superman sleeping with Lois in the Fortress in the second movie, it does not seem to fit his character well, but again the movies are overall fantastic! Props and costumes from the Salkind movies are very pricey so that has hindered my ability to collect some of that merchandise….. yet. But I still have a few things. I have one of Reeve’s capes from Superman II and a collection of hand drawn story boards from the “Kneel before Zod” sequence which is one of the most iconic in my opinion. 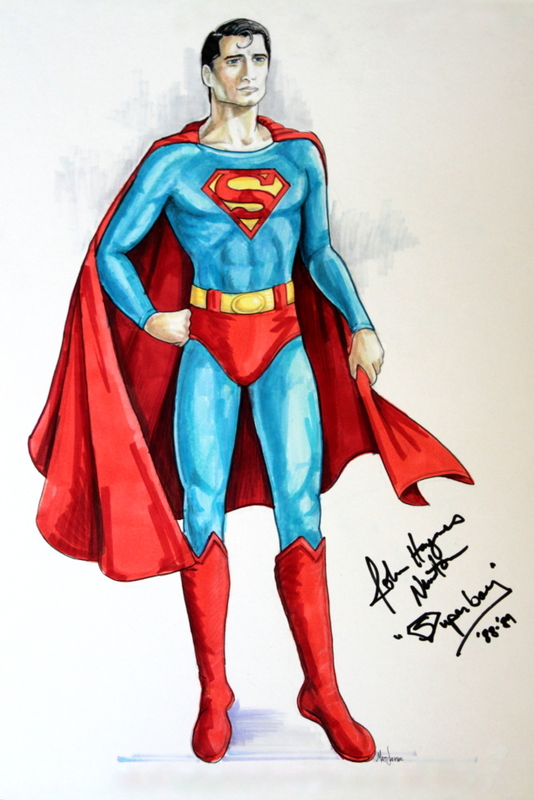 And please do talk us through the John Haymes-Newton Superboy costume you recently obtained – it looks to be in splendid condition and the costume design is, to my knowledge, a world-first reveal. How did you secure this and what is it about Superboy that resonates with you? This costume was actually at a pretty big auction house and I was fortunate enough to end up with the winning bid! 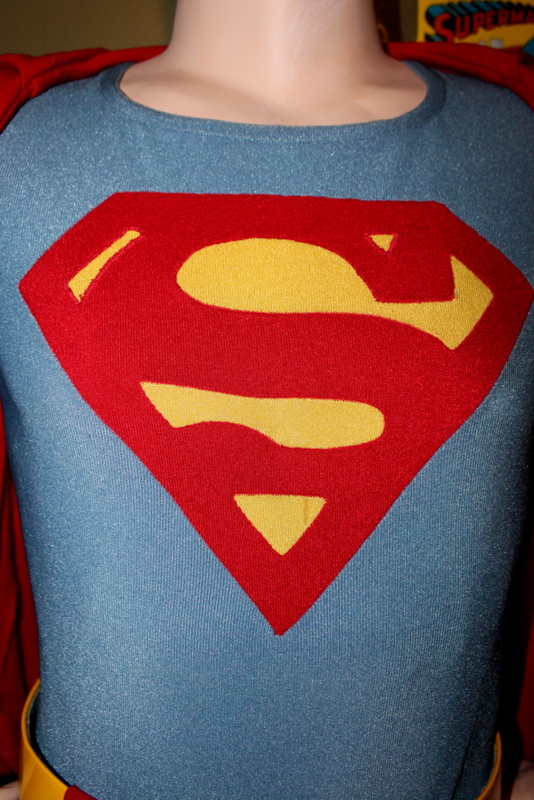 The costume was originally obtained from a Superboy contact by Jim Bowers and then sold to Franco Tuscanini. Franco recently passed away and his collection made available to the market. Now I am honoured to house this amazing piece in my collection. I have always loved the Superboy television series, but the main reason that I love the costume is because it is the closest thing to a true Christopher Reeve costume I can obtain and afford at the moment. The series was also produced by the Salkinds so the costumes were made remarkably similar to Reeve’s, in some cases even recycled. A Reeve costume in the modern market will sometimes break $100,000, but I was able to obtain this for a fraction of that cost. It displays well and remains a symbol to me of everything Superman stands for and his place in Hollywood history. And is that Tom Welling’s red T-Shirt from Smallville I see in the bottom left hand corner? Where and when did this materialise and was it a challenge to get? How do you display and maintain such expensive items? Yes. I mentioned earlier that it has been hard to obtain original Smallville props and costumes, but this is the one iconic piece I have been fortunate enough to make my own. This was first introduced to the collector market on screenused.com (one of the most reliable sources of screen used items on the web) and then actually popped up on ebay a while ago. The very hour it was listed I messaged the seller and worked out a deal with him. It included the COA and provenance. Displaying my items varies depending on what the item is and the rarity of the particular piece. I am currently a college student that lives near school so my collection resides at my parents in my room there. I am fast running out of room so my displays are often jam packed and tight. I still do my best to make sure everything is well lit and protected though, and use frames, cases, and other protective measures. I also use heavy curtains to block out light that may cause fading. I bought a couple glass cases from IKEA and lighting from Lowes and have picked up acrylic cases from various other places as well. My most prominent and expensive pieces obviously get the most attention as well as pieces that mean the most to me. Have you met many Superman celebrities face to face and gotten autographs? Who was your favourite and why? Was there any one living or dead you would really want to have met? I’ve been really fortunate to meet a host of Superman celebs. I have met- Brandon Routh, Dean Cain, Sam Huntington, Michael Rosembaum, John Glover, Justin Hartley, Stacy Haiduk, Margot Kidder, and Laura Vandervoort just to name a few. Most of these I have met at the annual Superman Celebration in Metropolis, IL. They have all been so nice it’s hard to pick a favorite. I would still LOVE to meet Erica Durance or Tom Welling from Smallville, and of course Christopher Reeve would be a dream if he was still alive. And finally what is your ‘grail’ item from the Superman pantheon? Do you have it already? Given an unlimited budget what would be the first thing you would seek to add to your collection and why? There are a couple pieces I would love to have, but the biggest hurdles are budget and actually tracking down the stuff. I would LOVE to own a significant costume of some kind from Erica Druance’s Lois Lane. And of course a Reeve costume would be fantastic. Action Comics #1 of course. A few years back the check that initially bought Superman from Siegel and Shuster went to auction, That would be pretty fantastic as well! Zack Curtis, Thank you very much..! Wow . . . . superb indeed. What an eye full.